Folders are used to establish a site's navigation and keep its content organized. Ideally, each section of a site and its pages are contained within a folder. Folders are also used to store files such as images and documents. Clicking on a folder will expand its contents in the asset tree. To select a folder and display its contents in the workspace (panel at the right), click on the magic folder arrow that appears when hovering over the folder. While creating or editing a folder, tabs are available at the top of the edit window to configure additional settings. 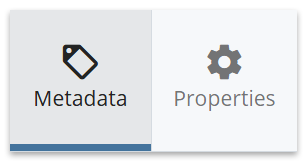 The Properties tab includes settings to manage the folder properties. When should I create a new folder? You want to create a new section on your site that will be included in the navigation such as "About Us" or "News". 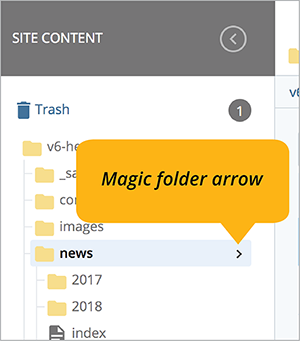 Creating a new folder (rather than making a single stand-alone page) will ensure the section has the flexibility to accommodate additional pages as the site evolves. You want to create a storage area for files (e.g., images and documents). The folder shouldn't be part of the site navigation, and it won't include any pages for website visitors. In this scenario, change the setting for Include in Navigation to No. I created a new folder for a new section on my site, what&apos;s next? The next step would be to build your pages within the folder. It's best to start with the main page of the section, and be sure to give it a system/page name of index. Once the folder contains the index page, it will display in the navigation.